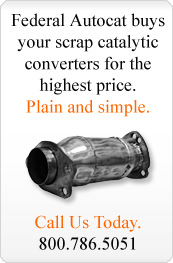 Below are some pointers to keep in mind when purchasing catalytic converters. NEW: The Standard Domestics and Standard Foreigns will make up roughly 30% of your purchase. If there is one category to learn first, focus on the aftermarkets. Aftermarkets are replacement converters for all scrap catalytic converters. The value of an aftermarket is only five to fifteen percent of the original part. So, this will have great impact on your bottom line. When buying half pieces make sure you inspect the inside for content and expect the weight to be lower. The color of the outside shell should be grey/metallic and appear used. Beware of converters that are bleached and empty. Please check inside! There sometimes will be two converters attached to each other. One is called a “Pre”. Usually Aftermarkets make up 10% and Pre’s 10% of your purchase. The size of the converter does not relate to the price of the converter. Remember: it’s what on the inside that matters. They are not delicate and can be handled aggressively. Does not have an expiration date. Contact us to learn more about our catalytic converter recycling program.